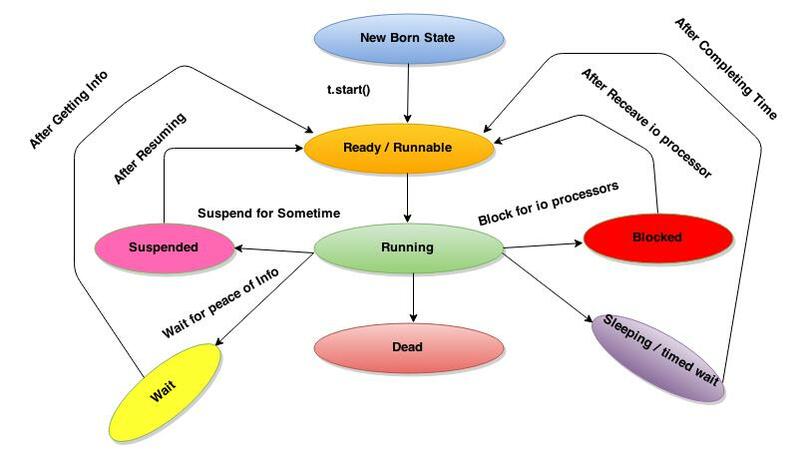 runnable state by thread scheduler. A thread being executed in JVM is in the running state. A thread which is blocked and waiting for a monitor lock is under this state. This can occur if a thread performs an input/output operation and shifts to next runnable state. A thread which is waiting for another thread (resource) indefinitely to carry out a specific action is under this state. A thread which is waiting for other thread to carry out an action up to a particular waiting time is under this state. TERMINATED (dead): A thread which has exited is under this state. Once a thread entered in to this state that will never come back.